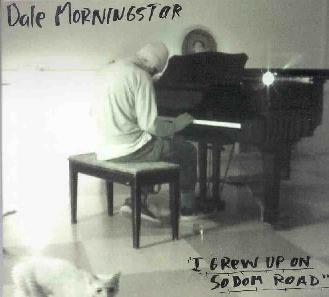 Dale Morningstar - "I Grew Up On Sodom Road"
Weirdo folkish music from a member of Dinner Is Ruined (nope, never heard of 'em, sorry). Not as brain-damanged as Daniel Johnston, nor as utterly OUT as Jandek, and not Incredible String Band/Comus/Wicker Man-influenced acid/psych-folk either. What you have here are a bunch of unpretentious, fairly silly, near singalong songs, with arrangements & production that are of well above average interest. No surprise, since in addition to his band and solo work, Mr. Morningstar runs the Gas Station Recording Studio, where he's recorded Godspeed You Black Emperor as well as many others. While the sonic space of this recording is far sparser than that band, the instrumentation is nearly as varied. Although there is (no surprise!) lots of acoustic guitar strumming, there are bits of flute, violin/fiddle, accordian, kazoo, organ/calliope, as well as samples, electric sounds, and even occasional beatbox. With no real breaks between the songs (except for a few short "link" tracks), the album flows smoothly like a quick dip into Morningstar's stream of consciousness. If not the 11-minute penultimate track, "If Mr. President Had A Brain" (which IS one of those noodling-kitchen-sink-recordings-that-goes-on-for-too-long, so probably only for the very stoned), then "The Highest Wave" will probably be the standout for AI readers (at least it's the reviewer's favorite), with various noises (electronic and acoustic) accentuating a slowly-building apocalyptic death-by-drowning scenario. And apparently, he really did grow up on Sodom Road (although not, unfortuantely, at the corner of Gomorrah drive). For more information you can visit the Sonic Unyon web site at: http://www.sonicunyon.com. Contact via snail mail c/o Sonic Unyon Records; PO Box 57347; Jackson Station; Hamilton, ON; L8P4X2; Canada.